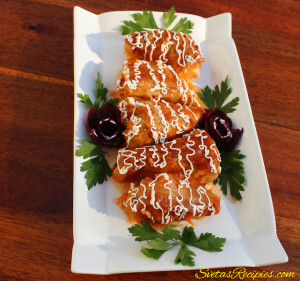 A cabbage roll is a dish consisting of cooked cabbage leaves wrapped around a variety of fillings and a meaty rice mixture, tomato mushroom sauce. Ingredients: 1.) Wash and dry all vegetables. 2.) 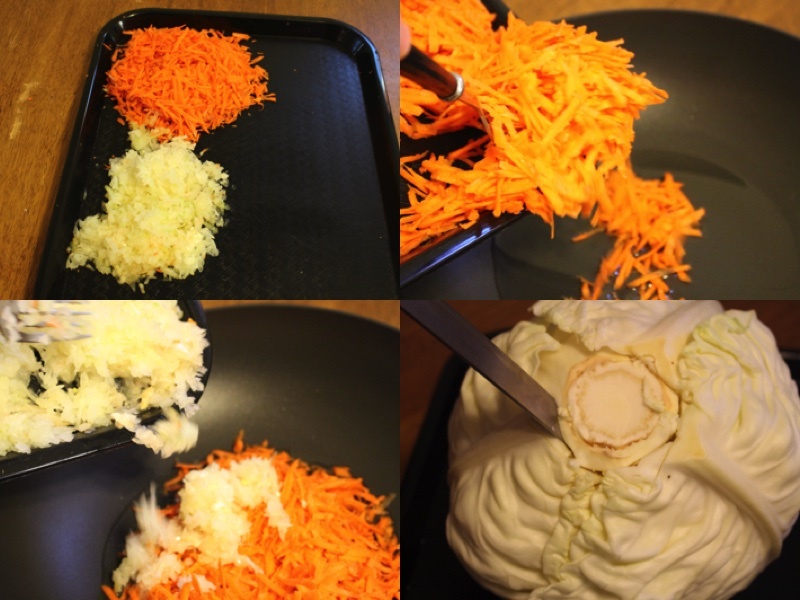 Peel Carrots and onions, shred carrots and onions. 3.) Throw it in a preheated hot oil skillet. 4.) Sauté onions and carrots until tender but not brown. 5.) Cut remove the core out of the cabbage. 6.) Wash rice 4 times under cold water. 7.) Drain in a colander. 8.) Cook rice for 5 min in a boiling bot with salt, drain off the water once done. 9.) Place cabbage into a separate boiling pot cook until leaves are easily detachable, remove leaves with water. 10.) Mix together carrots, rice, ground pork, onions, pepper and salt. 11.) Cut coarse section from the base of each leave. 12.) If the pieces of each leave are large split them into 2 separate pieces. 13.) Shape pork mixture into the center of each cabbage leave, overlap sides, roll up. 14.) 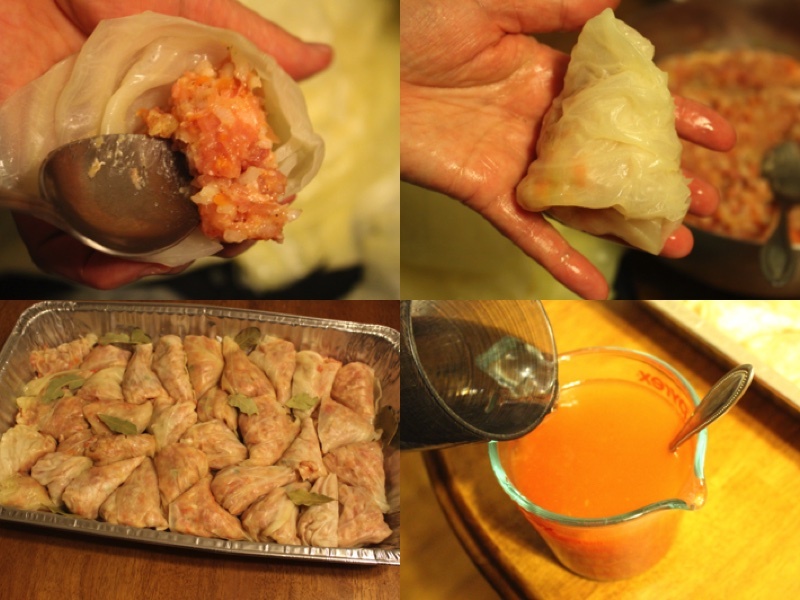 Place rolls on a sheet, mix tomatoes sauce with 1.5 cups water. 15.) Pour the tomato mixture over the cabbage rolls, cover with tin foil. 16.) Bake in a preheated 370F Oven for 1 1/2 hours, after place rolls on serving plate. Peel Carrots and onions, shred carrots and onions. Throw it in a preheated hot oil skillet. Sauté onions and carrots until tender but not brown. Cut remove the core out of the cabbage. Wash rice 4 times under cold water. Cook rice for 5 min in a boiling bot with salt, drain off the water once done. 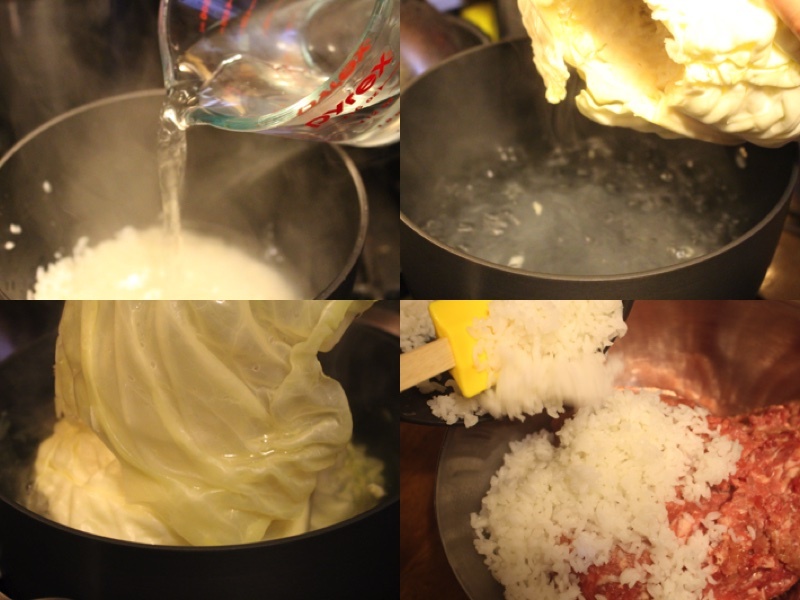 Place cabbage into a separate boiling pot cook until leaves are easily detachable, remove leaves with water. 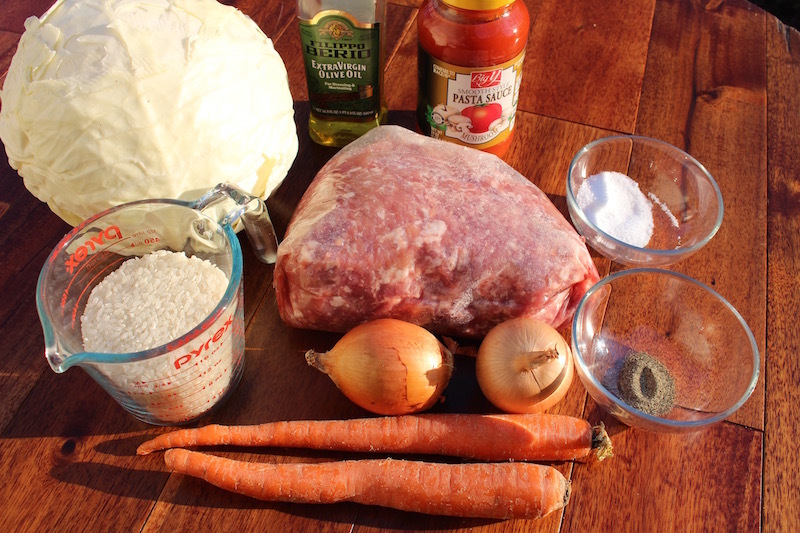 Mix together carrots, rice, ground pork, onions, pepper and salt. Cut coarse section from the base of each leave. If the pieces of each leave are large split them into 2 separate pieces. 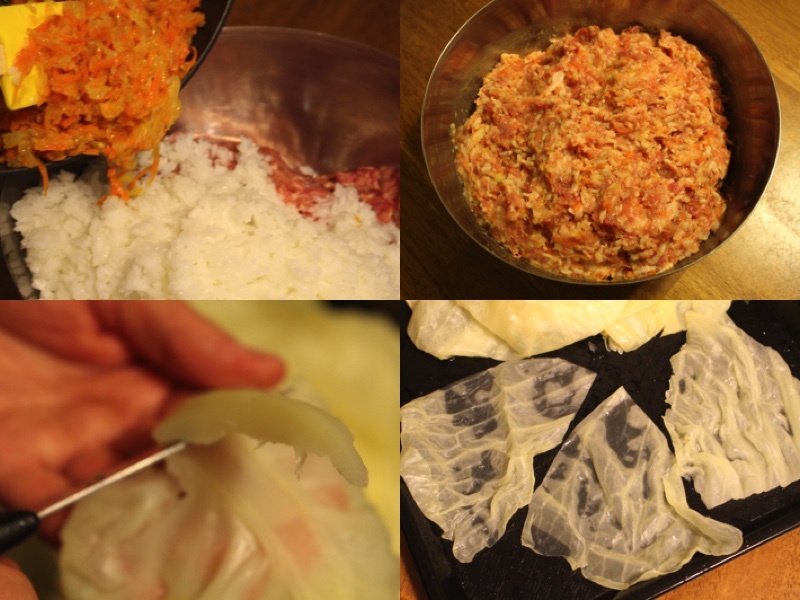 Shape pork mixture into the center of each cabbage leave, overlap sides, roll up. Place rolls on a sheet, mix tomatoes sauce with 1.5 cups water. 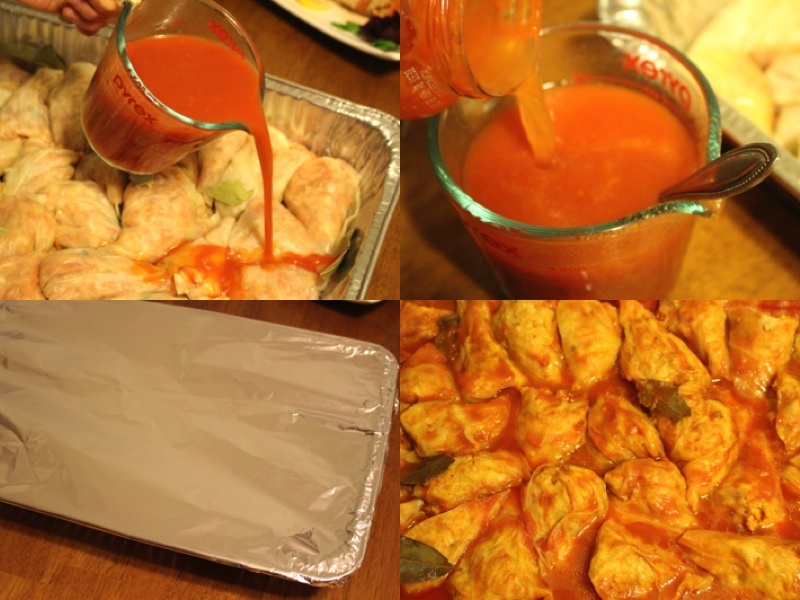 Pour the tomato mixture over the cabbage rolls, cover with tin foil. Bake in a preheated 370F Oven for 1½ hours, after place rolls on serving plate. Wow.. never thought I can cook golyptzi in aluminum trays… Thanks for sharing. One questions what part of Ukraine are you from? ohh yes. its easier with it. I’m from the Western part. Sarny. Thank You.